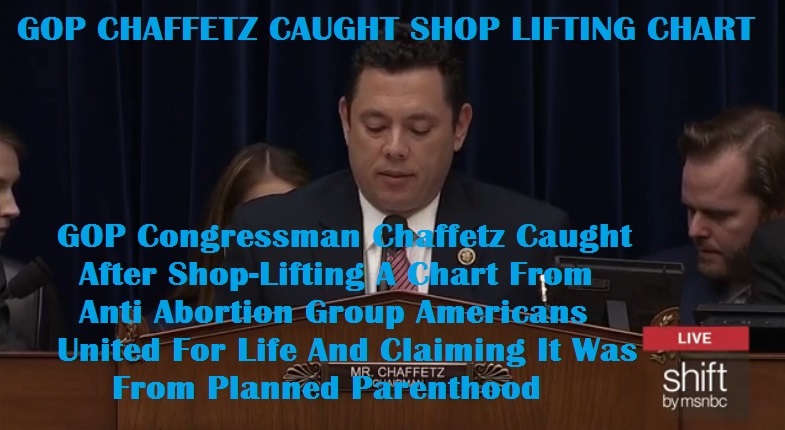 Republican Representative Jason Chaffetz Was Caught Red-Handed After Shoplifting A Chart From Americans United For Life – An Anti Abortion Group, And Claiming It Was From Planned Parenthood. 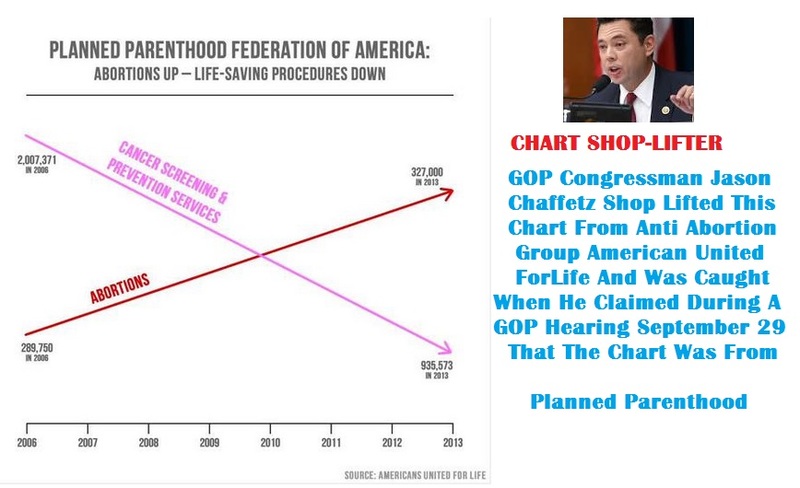 What the slide actually shows, of course, is that the number of abortions performed by Planned Parenthood rose very modestly between 2006 and 2013, while the number of anti-cancer services it performed did indeed fall by more than half. But Richards said some of the services, like pap smears, dropped in frequency because of changing medical standards about who should be screened and how often. The Six Corporations Own: All of the 1,500 Television Stations, 9,000 Radio Stations, 1,500 News Papers, 1,100 Magazines, 2,400 Publishers – All Owned by the Six Corporations and of course as we are aware according to the US Supreme Court, Corporations are people and Corporations are Big Business and Big Business likes Republicans, because Republicans protect the 1%. There aren’t any more Dan Rather, Peter Jennings, Barbara Walters, Dianne Sawyer, Walter Cronkite, but we do have are Low-Level Puppets hiding behind the word Journalism. If you haven’t noticed this drastic change since the 2010 Mid Term Election into the Presidential 2012 Election and the 2014 Mid Term and now into the 2016 Presidential Election, then you may not be as smart as you think. 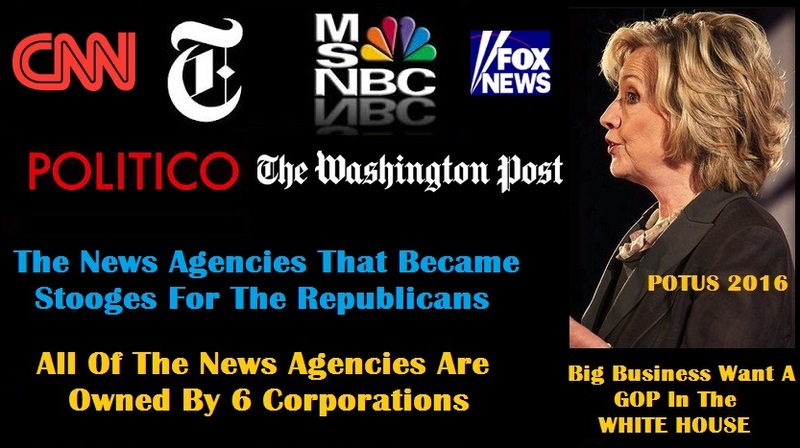 The Media; the New York Times, Politico, Washington Post, CNN, MSNBC, FOX and other News Outlets have become Stooges for the Republicans! WASHINGTON — House conservatives, fearful that the post-John A. Boehner era of leadership may look more like a modestly renovated old house than a newly built one, have begun to cast about for one of their own to join the upper ranks: the head of the committee that has been ripping into Hillary Rodham Clinton for well over a year. “He is the kind of smart fighter our country needs and the American people deserve,” Representative Mia Love, Republican of Utah, said in a prepared statement Tuesday. Ms. Love is among a growing number of members getting behind the “Draft Gowdy” movement, begun in part by Mr. Gowdy’s colleagues in the South Carolina congressional delegation. “With impressive communication skills, genuine compassion and the tenacity of a prosecutor, he will unite the party and the people around a truly American agenda,” she said. Representative Jason Chaffetz, Republican of Utah and chairman of the House Oversight and Government Reform Committee, also supports a promotion for Mr. Gowdy. 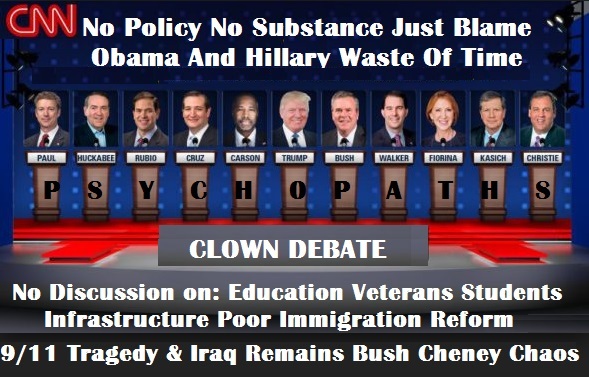 Carly Fiorina Never Had Any Children And Her Description Of A Planned Parenthood Video Doesn’t Exist! But, She Wants To Be President! 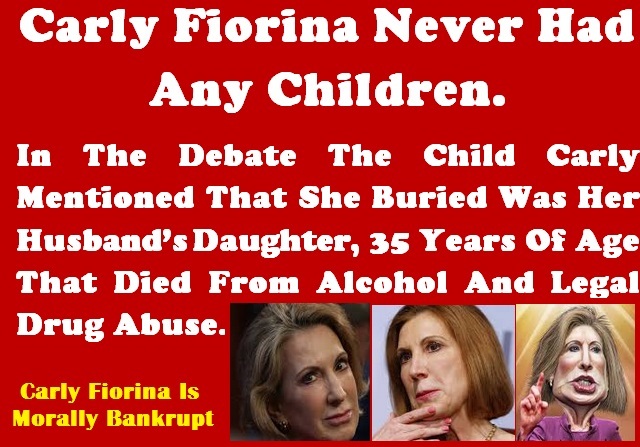 The Child Carly Fiorina Said In The Debate That She Buried Was The 35 Year Old Daughter Of Her Husband. The Woman Died From Alcohol And Legal Prescription Drug Abuse. STEPHANOPOULOS: Another powerful moment last night was when you talked about those Planned Parenthood tapes. But analysts who have watched all 12 plus hours say the scene you describe – that harrowing scene you describe — actually isn’t in those tapes. Did you misspeak? FIORINA: No, I didn’t misspeak and I don’t know who you’re speaking about in terms of watching the tapes but I have seen those images. I don’t know whether you’ve watched the tapes, George, most people haven’t. Certainly none of the Democrats who are still defending Planned Parenthood have watched those tapes. Planned Parenthood needs to be defended. This kind of butchery erodes at the character of our nation. FIORINA: Well, you know, there’s a lot of commentary about these tapes being doctored. 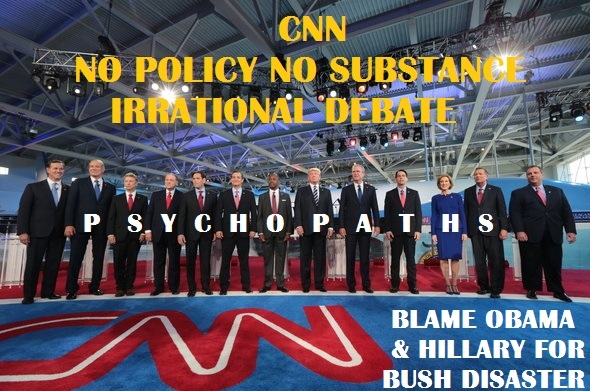 In fact, that’s what the mainstream media keeps talking about, is the tapes and their origin. Rest assured I have seen the images that I talked about last night. Rest assured that human lives are being aborted fully formed in order to harvest body parts. Rest assured that this erodes at the character of our nation, and once again I will say, I dare Mrs. Clinton and President Obama, two defenders of Planned Parenthood, to watch these videotapes. [NYT] So it went, somewhat tediously and surreally, for many stretches of the debate on Wednesday night and especially for the first half-hour, during which Rand Paul took the precise measure of — and raised the correct question about — the egomaniacal front-runner. “Do we want someone with that kind of character, that kind of careless language, to be negotiating with Putin?” Paul asked. “I think really there’s a sophomoric quality that is entertaining about Mr. Trump, but I am worried,” he added, and I nodded so vigorously at the “worried” part that I’m going to need balm and a neck brace tomorrow. Fiorina held her head, including her face, high. “I think women all over this country heard very clearly what Mr. Trump said,” she stated tightly, and with more dignity than Trump or the situation deserved. 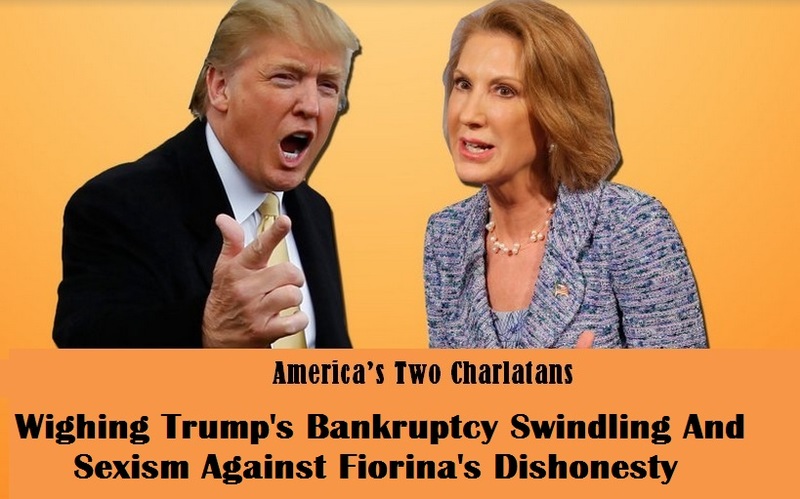 Trump rushed in: “I think she’s got a beautiful face and I think she’s a beautiful woman.” Watch out, Carly. 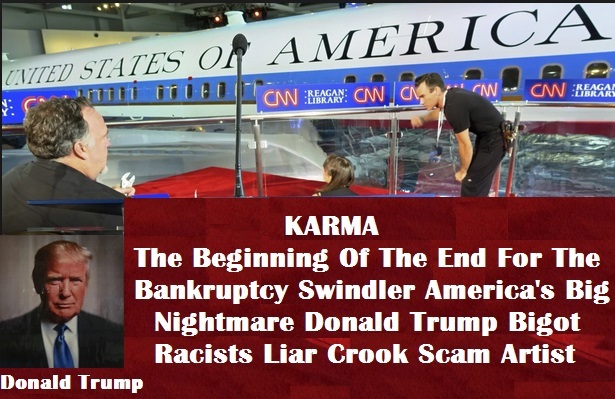 Next comes an invitation for a private ride in his Trump-i-copter. I mentioned my nodding, but my real injuries came from shaking my head, over and over, because I couldn’t quite believe the Trump-centric nature of it all. I’m still mystified that he’s done this well in the polls for this long. I know that Americans have lost faith in institutions — understandably. I know that Americans are turned off by politics as usual — justly. But have we sunk to a point where we’re prepared to reach for someone so careless with his insinuations, so merrily and irresponsibly ignorant, that he used some of his precious time on Wednesday night to fan irrational, repudiated fears about a link between vaccines and autism? Are we buoyed by a bully who calls anyone who disagrees with him a “loser,” promises vaguely that his presidency will be “unbelievable” (his favorite adjective, and an unintentionally telling one), and presents little besides his tumescent ego and stagey rage? 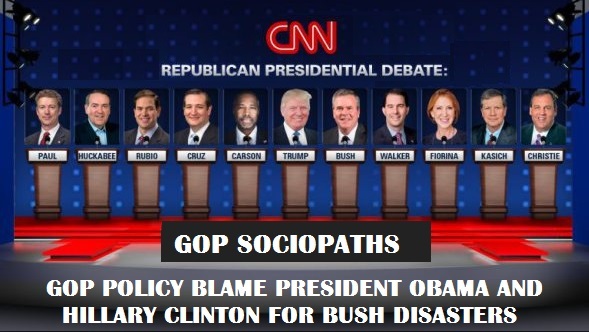 The CNN anchor Jake Tapper, who was the debate’s moderator, pressed hard to get Trump to say, with even a scintilla of specificity, why he believes that he’d be more effective in dealing with Vladimir Putin than Obama has been. How? Why? Not a single detail. But Trump doesn’t do details. He just crows that he will know the most, be the best and win. He’s a broken record of grandiose, self-infatuated music. The most satisfying, encouraging moments of the debate were those when other candidates tried to point that out directly or indirectly. Chris Christie did so several times. During his opening remarks, he asked the camera to move from him to the audience, saying that the election isn’t really about the candidates, who soak up the spotlight, but the people, who deal with the consequences.